This is a faithful recreation of Doom 2's Map07, one of the few good DM maps included with the game. 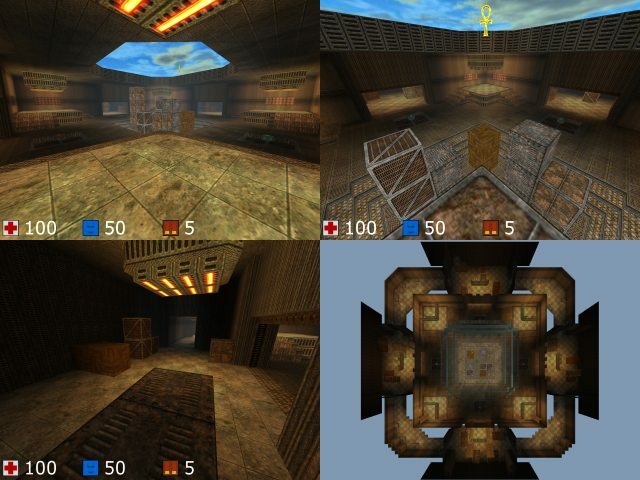 The geometry is accurate to within half a cube (to the map's fully-triggered configuration) everywhere that Cube's design allows, with exceptions for the box stacks and the diagonal hallways. Texturing is unfortunatly not as precise. 8 playerstart positions make respawn frags less common than in most DM maps this simple. Every weapon, along with armor and the quad, is available in the central room, at the risk of high exposure. Extra shotgun shells and health packs are arranged along the outer rooms and hallways. Lighting in this map is rather detailed, resulting in WQD as high as 7500 with default settings. If this is a problem for your computer then '/lighterror 64' will help tremendously. -Official Motto, U.S. Army Sniper Reg.